Tell Mashnaqa is located at the Khabur, a tributary river to the Euphrates, about 30 kilometers south of Hassake in northeastern Syria. It is of moderarte size covering less than four hectares. One of the most remarkable finds at the Ubaid level of the site were fragments of two pottery boat models, excavated in 1991. The models represented long, narrow canoes with pointed sterns. The boats were made of reed coated with bitumen to make them water-proof. The most important finds from the Ubaid period at Tell Mashnaqa is part of the permanent exhibition in the Museum in Deir az Zor, including a reconstruction of an Ubaid burial and the original boat models together with the reconstruction suggested by Jan Skamby Madsen and Morten Gronbech. The boats were made of terra cotta and painted with motifs similar to the style appearing on the pottery. These boat models have been examined at the Vikingship Museum in Roskilde, Denmark, by Jan Skamby Madsen. 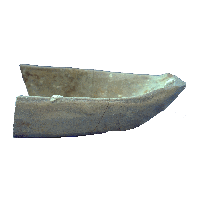 The shape and features of the models made it possible to identify the actual boat type. It is a river boat made of bundles of reeds and on the exterior tightened with bitumen. I only have the image of one of the two objects. This rather small model was different and probably easier to handle than his contemporary found in Eridu.